Blindness is devastating. At any age. But a child without sight, whether by birth or by accident, is especially tragic with their entire future at risk. Children who are partially or totally blind are unable to participate in the world around them as sighted children are, which effects their social growth, their learning and virtually everything related to growing up. 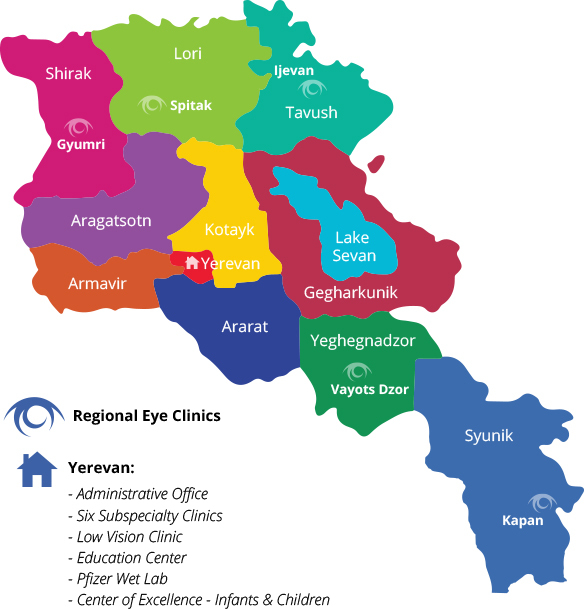 Good eyesight is critical for the children in Armenia to grow up with all the advantages they need to be healthy, happy, productive citizens. 80% of what a child learns depends on the efficiency of the visual system with vision problems in school-age children very frequently leading to learning problems. According to experts, almost 50% of children with learning difficulties have vision disorders. In most cases these problems can be successfully treated leading to improved learning and better grades. Blindness is 80-90 percent preventable or curable! Before your child is born, it’s very important for you to have regular prenatal care and to eat a nutritionally balanced diet and practice good hygiene for her eyes to properly develop. Mothers-to-be should make sure they have received all of their immunizations prior to becoming pregnant – mumps, measles and rubella. One of the major causes of childhood blindness is mothers who have German measles during pregnancy. Your baby’s eyes will be checked immediately at birth when the doctor administers eye drops to prevent an infection. If your baby is premature, make sure her eyes were thoroughly checked at the hospital before you brought her home. If not, make an appointment to see an eye care professional. Your baby’s vision begins to develop at birth and continues throughout her first year of life. Born with an underdeveloped visual system, she can see patterns of light and dark and shades of gray and can only focus eight to twelve inches. She learns to focus by looking at faces and then gradually moving out to objects of interest brought near her. When infants begin to follow moving objects with their eyes, tracking and eye teaming skills develop as they begin to learn to coordinate their eye movements. Soon they begin to reach for objects-the beginning of eye/hand coordination. As your baby grows, more complex skills, such as visual perception, develop to meet her growing need to understand and interpret her world. By four months of age, your baby can see full color. Babies usually see movement before anything else. Full-term babies should be able to see their mother’s facial expression within a week of birth. Color vision is not yet fully developed at this time. Depth perception will also mature during the first year of life, as long as both of the child’s eyes are working as a team. Eye muscle coordination in a newborn, as well as a small child, is also very immature. Babies often exhibit eyes turned in, turned out or not working as a team, called strabismus. This happens when the muscles of one side of the eye pull more than the muscles on the other side. If this problem doesn’t resolve itself by the age of continues past three or four months, consult your pediatrician or eye care professional a doctor. As babies learn to push themselves up, roll over and sit, eye/body coordination develops as well as their eye/hand coordination develops. They are able to reach and grasp at objects freely or direct a bottle into the mouth. By the fourth or fifth month, babies’ brains have finished learning how to fuse the pictures coming in from both their right and left eyes into a single image for full binocularity, or “two-eyed” vision with strong depth perception. As babies learn to aim accurately when reaching for objects their spatial and dimensional awareness continue to improve. Between four and six months, your baby should start to reach or bat at the mobile or toys you hold in front of her as her vision, depth perception and understanding grows. Many toys can help your child develop vision and have fun at the same time. Ask your pediatrician about developmental toys. As your baby learns to look quickly and accurately between near and far distances she refines her eye teaming and focusing skills. By the time she reaches six months her normal vision visual acuities has usually developed to 20/20. From six to 12 months, your child may be crawling and walking. By the sixth month, babies acquire fairly accurate eye movement control and by eight to 12 months they are judging distances well. Their eye/hand/body coordination enables them to grasp and throw objects fairly accurately. Perception skills such as visual memory and visual discrimination help babies make sense of their exciting new world. The integration of their vision and fine motor coordination allows babies to manipulate smaller objects, and many begin feeding themselves with finger foods. Once children start walking, they learn to use their eyes to direct and coordinate their bodies’ large muscle groups to guide their whole body movements. Children’s vision continues to develop throughout their preschool years. As toddlers, it is important for them to continue development of eye/hand/body coordination, eye teaming, and depth perception. Stacking building blocks, rolling a ball back and forth, coloring, drawing, cutting, or assembling lock-together toys all help improve these important skills. Reading to young children is also important as they develop strong visualization skills “picturing” the story in their minds. It’s important to watch your child closely and be aware of her vision development. If you suspect it is not developing normally seek out the help of an eye professional. Things to look for include if your child’s eyes are grossly turned in or out; if they don’t move normally before age three months; if the eye is crossed far into the nasal area; if one eye moves while the other remains still; or if one eye appears radically different from the other. Large-scale eye movement problems can be remedied with surgery if necessary. Seeing your pediatrician early also helps. Catching strabismus early is important, because a visual condition called amblyopia may result if strabismus is left untreated. If your child doesn’t see well out of one eye due to strabismus, the eyes aren’t working as a team to see. If your child’s brain doesn’t receive visual images from that eye, eventually the brain will “shut off” that eye and vision could be permanently lost. A vision condition called nystagmus can develop in infancy. Eyes that jump, dance, wiggle or oscillate back and forth is called Nystagmus. This condition may be caused by poor vision or defects in the nerve pathway from the eye to the brain or albinism. Nystagmus may also be inherited. Babies with nystagmus may have normal vision or poor vision. If your child’s nystagmus persists past age three months, consult your pediatrician.